While most of the exhibitors are remaining tight-lipped about new developments, there will be a number of new model launches at the three-day event. The show is also a shop window for many of the UK’s top convertors and bodybuilders, who provide anything from lighting and racking systems through to bespoke vehicle bodies. As of early February, exhibition space is said to be close to capacity, and what is clear is that leading names from across the commercial vehicle spectrum, road transport, distribution and logistics supply business will feature. 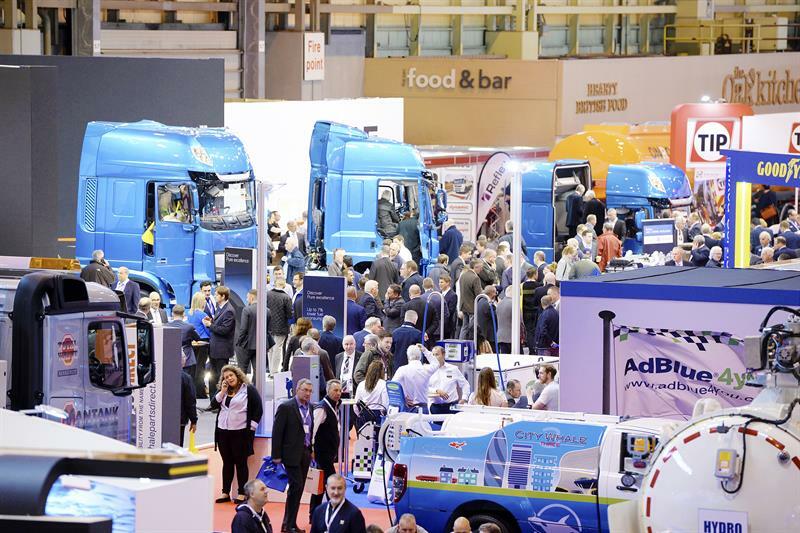 From truck, van and trailer manufacturers, insurers, tyre companies, telematics, training providers and fuels and lubricants suppliers, the CV Show is a one-stop shop for everyone involved in the commercial vehicle world. Visitor registration is now open via the official website: https://cvshow.com. After exceeding 20,000 visitors last year, the event retains the larger floorplan in halls 3A, 4 and 5 in 2018 to accommodate the rising numbers of exhibitors. Following the continued success and popularity of two specialist sectors, the show will once again feature dedicated zones for workshops and temperature-controlled transport. The Workshop zone in Hall 4 will show off a range of products and services to keep vehicles running at maximum efficiency, from OE components and replacement parts to maintenance management systems, garage, workshop and bodyshop equipment. For those transporting temperature-controlled goods, the Cool zone in hall 3A will provide a range of refrigerated vehicles and bodywork, side by side with the latest fridge units, monitoring equipment and other products. Not all exhibitors are keeping quiet; a selection of early show news is below. More advance information will be included in next month’s CV Show issue. Stop, pick up the latest copy of the magazine and meet the people behind it. For the first time in several years, Transport Engineer has a presence at the NEC, on one corner of a redesigned IRTE stand. And we are taking best advantage by showing off some of the highlights of the magazine, which is just one of the benefits of joining the IRTE. There is also a special offer for attendance to our IRTE Conference, 27 September 2018 at the Leicester Marriott Hotel. Other corners of the IRTE stand pull out just a few of the engineering institute’s other initiatives and membership benefits. They include:facilitating members’ registration with the Engineering Council (providing technicians with postnominals, such as EngTech); technician and workshop licensing accreditation schemes, which provide an independent verification of their quality; its support of technician trailblazer apprenticeships; and the vital role of partner S&B Automotive Academy, hosts of the IRTE’s Skills Challenge for bus and coach technicians. The company’s largest ever stand, at 180m², will provide the UK’s first view of the Autopstenhoj Quattrolift 4.65 F 480, a 6.5-tonne capacity electro-hydraulic four-ram lift with special wheel alignment platforms. Other equipment on show includes Somers mobile column lifts, an Autopstenhoj Maestro 5.5-tonne, two-post lift and the Bradbury H2603HG six-tonne capacity two-post lift. From a test equipment perspective, there’s Gemco’s Sherpa range of roller brake testers and test equipment, with two in-ground and surface-mounted (mobile) solutions. Training provider Fleet Source, which is part of the Fleet Operator Recognition Scheme (FORS) Community Partnership, is hosting a clinic. Also, it is promoting its Driver CPC course, Terrorism Risk and Incident Prevention (TRIP). Workshop lift supplier TotalKare is presenting its T8DC lift, which will be exhibited raising a Volvo FH tractor unit. This cable-free unit has a capacity of 7,500kg per column, and adjustable forks that enable users to fit a variety of wheel sizes from 700mm to 1,400mm. Also on show is its 5.5-tonne capacity two-post lift, suitable for vehicles with long wheelbases such as Mercedes-Benz Sprinter and Volkswagen Crafter vans. A Volvo rigid tipper will be hoisted by TotalKare’s 25,000kg capacity, nine-metre fixed post lift, fitted with a jacking beam and lighting kit. Launched last year to selected fleets including Iceland Foods and Calor Gas, Trakm8’s RoadHawk 600 telematics camera is now in full production in the UK. The dash cam can be fitted with a single or dual camera to monitor the driver as well as the road ahead. The combination of a camera and a telematics unit is said to minimise the cost and downtime of buying and fitting separate devices. Also being promoted is Trakm8 Prime for small to medium-sized fleets, which combines GPS tracking with a driver scoring system and Trakm8’s vehicle health alerts. BrakeCheck – the DVSA-approved portable brake tester for recording and printing brake test results – is on show. Alongside that product is the recently announced BrakeCheck Geo, which contains a built-in GPS receiver so that the exact location of the brake test can be recorded, along with the brake test results. Other diagnostic products on display will include SensorCheck, for quickly diagnosing ABS-related faults without having to remove the road wheel, and TrailerCheck, which allows a single technician to test trailer lighting, ABS circuitry and CAN activity. Visitors to the stand will also be able to see a live demo of Bowmonk’s on-board weighing system, including a Bluetooth link to a nearby smartphone for single-technician loading or electronic recording of weight data.